April truths about outsourcing: Finance leaders are looking to providers' capabilities more than ever, but are they really prepared to change? While the world still known as "outsourcing" was quaking in fear at being renamed "augmentation" (hehe), we received some interesting notes from people with alternative suggestions for their beloved industry. Unfortunately, some of these people had failed to read the full posting to figure out it was an April 1st wind-up, but, what the hell, it inspired some pretty good debate! Very interesting indeed. Wondering if the marketplace will accept the replacement term "augmentation". Personally I think the term "augmentation" indicates - restrictively - that service providers only do that, augment and nothing else. However the marketplace has grown significantly on the back of "new" capabilities providers have brought to the table of buyers, not by augmenting but by "installing" or "instituting" practices, solutions etc and made the buyer organizations look smarter!!! a) "Augmentation of existing operations". When a provider is "augmenting" a process (or cluster of processes), they're improving it, they're removing some unnecessary sub-tasks, or even tweaking it to work with a new software application. Whatever they're doing, they're trying to make it function more effectively in an externalized environment that likely involves staff on both client and provider teams. b) "Instituting new practices and capabilities". The nirvana, to which most ambitious providers aspire, is to have their clients move onto "shared" solutions they bring to the table that have pre-configured quality process flows and technology underpinnings that they can implement across their multiple clients, resulting in more profitable engagements for them, increased price-competitiveness in the market and - hopefully - new capabilities and improvements to delight the end-customer and win even more customers. Hence, we would class augmentation efforts as process improvement (i.e. labor arbitrage with a few tweaks), and what Bobby is suggesting - instituting new practices - as something akin to "innovation", as this involves new, and often unique, methods and capabilities to make buyers be more successful. There's no doubt the industry wants to shift outsourcing engagements away from mere augmentation to the actual institution of new capabilities, however, the missing link is clearly whether the service providers can be incentivized to invest in their clients, with clients similarly being incentivized to make more radical overhauls of what they have. 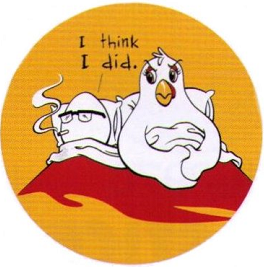 Clearly, we have a "chicken and egg" situation going on in today's outsourcing business. 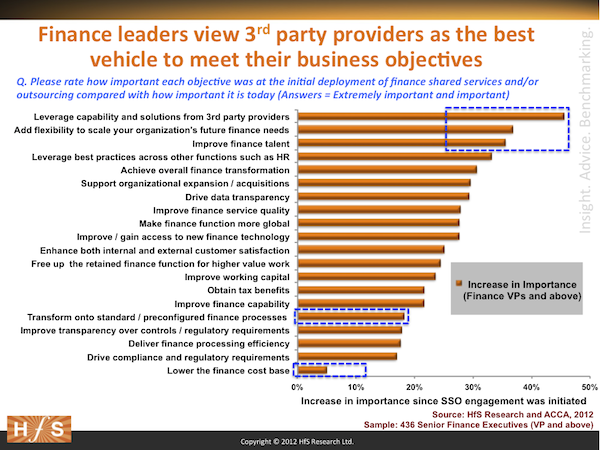 Finance leaders really want to increase their access to capability and solutions from 3rd party service providers. Finance leaders have viewed this criteria as increasing by 46% in importance since they embarked on their SSO. This clearly implies they have seen what providers can/are bringing to the table up-close and have realized these attributes are what they need to reach new levels of success. This is a significant cultural shift from years-gone-by, when they over-relied on inhouse staff development and heavy ERP investments to improve finance with limited help from the outside. Most finance organizations today are tired of constantly fighting ERP dysfunction and poor process quality and are more focused on third parties to bring new ideas/best-practices/technologies to the table. Moreover, as we have been seeing repeatedly at HfS, clients are increasingly recognizing the cultures and internal capabilities of their service providers and want to nurture these skills and learning environments into their own finance organizations. Improving talent and flexibility to scale the finance organization is paramount. While leveraging provider capability is the most significantly growing objective, improving finance talent and scaling finance are close behind. We see the desire from function heads to globalize processes and have their internal managers get a better handle on scaling finance to service the needs of the business, as critical goals of finance leaders today. Clearly service providers, in addition to management consultants, are in increasing demand to help their clients develop smarter global delivery models that encompass their available talent across shared services, outsourcing and inhouse teams. It's no longer about clients managing each delivery model in silos - it's about bringing them all together as one cohesive framework. Standardizing process is desirable, but not a lot of companies are really doing it. This objective only grew by 20%, which will disappoint some providers which are banking on pushing their clients into more radical overhauls of some of their internal processes to adopt their own workflows and best practices. In many ways, this really is telling us finance leaders are more focused on augmenting what they have, than completely overhauling processes with better ones. Everyone says they want access to best-in-class processes, they say they want to blow up non-core / not critical processes and have them standardized and made more efficient - so why, pay tell, do they not do it. We use the payroll example a lot, the most commonly outsourced finance/HR process, whereby many CFOs / CHROs long gave up the ghost that there was any real strategic advantage keeping payroll inhouse, but even that case, barely a third of mid-large organizations have actually outsourced it? The Bottom-line: Service providers are in pole position to provide the value clients need, however, there needs to be some give-and-take on both sides to move beyond mere "augmentation"
The augmenting versus instituting argument really sums up where we all are as an industry at present; providers want to institute offerings that they can scale (standardize) and execute well, whereas buyers want the execution without the standardization. They want providers to bring them all the goodies at competitive prices to make them look really good, but are yet to really embrace the internal change they have to go through in order to get the outcomes that they want. The key is for the chickens and the eggs is to figure out together which ones came first. OK - that makes no sense! The key is for the buyers and providers to figure out the right ways to engage, so that both are incentivized to invest in the relationship and the outcomes together. There has to be a bit of give-and-take - i.e. buyers need to understand that providers want scale and utility and would like to leverage their capabilities with other clients and not just them. Similarly, providers need to understand that buyers' needs are often complex and it's not always "clear cut outsourcing". As our research will reveal shortly, far more buyers rely predominantly on shared services delivery models, and outsourcing engagements still tend to be treated as discreet, augmented support services. In these cases, providers need to (at least at first) accept they need to work within the confines of their clients' global delivery models that many not always suit them. Both sides need to look at the bigger picture to work out how to really find future value from each other. Providers need to stop managing each client like a P&L and clients need to be prepared to understand what will encourage providers to share more of their delights. Still waiting for a brave buyer and provider to step and show the rest of the industry the light! 'Augmentation' vs. 'Instituting'. Good way to frame the path that the outsourcing industry needs to take. It's about who learns from whom. If the provider learns from the buyer, then it's Augmentation. If the buyer learns from the provider, then it's Instituting. Given that educators make more money than students, providers are well advised to continue climbing the value chain. So you think YOU have sourcing talent?